Please enjoy a quick peek at some renderings of our work for Lincoln Park 2550 – the newest building on Lakeview. The 39 floor, 377 foot tall tower with 218 Luxury Residential units was designed by architect Lucien Lagrange and represents a most elegant European style. It stands in perfect harmony with Chicago’s grandest lakefront structures, offering a one-of-a-kind location with forever-protected views of Lincoln Park, Lake Michigan, the Harbour and the Chicago skyline. The first three renderings illustrate our recommendations for refining a master suite in the north facing, four bedroom, 4,400 square foot “D” unit, by combining two bedrooms to create His and Hers baths, a walk-in dressing room, and separate sleeping chamber. Floating the bed in the middle of the sleeping chamber brings two spectacular city views into play and provides accessibility to the bureau plat. A combination of parchment and Zebrawood creates spectacular ambiance in the dressing room. There are many kinds of opportunities available to modify a southeast facing, 3,000 square foot unit with its significant Chicago skyline view. By removing the guest bedroom wall and powder room – we created a magnificent first impression. We also modified the master suite to provide access to the terrace and additional closet space. Subtle but strategic changes to a south facing residence achieve a dramatic first impression with Lincoln Park in the foreground of the magnificent Chicago skyline. The setting is flooded with daylight and a spectacular night scene. The new dressing room includes additional closet and storage space. Antique mirrored cabinets lighten the look, though any style door can be chosen to satisfy a buyer’s preference. The newly located sleeping chamber includes adequate space for a King-size bed and pair of chests. The south facing windows offer the same great south view plus a door to the terrace. One of our clients purchased a home as an in-town residence and commissioned us to alter the floor plan to accommodate their family which includes four children. We moved some walls to gain an extra bedroom, designed numerous built-ins, installed recessed lights throughout, and added a fireplace to the family room. This was one of the first design concepts we presented to them……. The crown moldings were eliminated to introduce a more modern vibe and we proposed the valances drop from the ceiling to just below the top of the window frames. Our furniture selections in this plan, were square and architectural. In another design concept, we dropped the ceiling so we could install recessed lights, kept the crown moldings and valance while introducing furnishings with more organic shapes. In keeping with the more vintage flavor of the building, our clients elected to drop the ceiling and keep the crown moldings. They did not like the valance so we substituted a simple, beautifully finished decorative rod for the draperies. Soft, elegantly curved furniture rather than the sharp, square corners of architectural pieces ensures the safety of the children. Our floor plans for the full floor raw space of the 12,506 square foot duplex penthouse take their cue from the vertical risers that determine its design possibilities. Our concept for the living room was influenced by a famous Magritte painting. 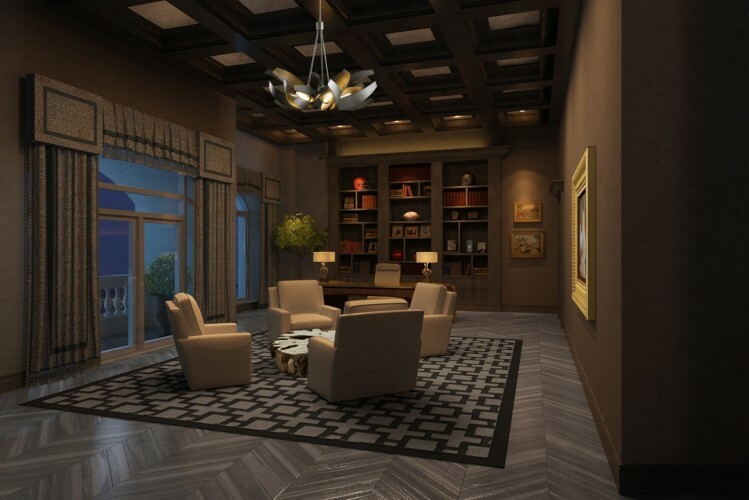 The cool neutral palette flows into the penthouse’s library where traditional architectural features are transformed into a modern and dramatic environment. Who wouldn’t want to live like this? In the market for a new home? Another home? An in-town? And/or a great holiday gift? These are only a few of the floor plan options available at this magnificent one-of-a-kind building. Give Lincoln Park 2550 a look. You will be glad you did. And, if you want someone to tag along, please let me know. I love this building and all the possibilities it offers. “May your world be beautiful” and enjoy this holiday season. You have to be delighted with this; stunning! This looks great. I love the penthouse library. The “C” tier is my favorite in this building because of the layout, and of course the view! The penthouse library rendering is great – very dramatic! Wow. John, these are beautiful. You are truly gifted. It is always an honor to have Edelman leather in any one of the beautiful spaces you design. Beautiful work, John! It’s always fun to see your latest projects and new directions. Your work is exquisite! The building turned out beautiful. Makes me miss the city. My Swaim rep just sent me the pics from your last 2550 project!! How beautiful!! Congrats on a gorgeous installation!!! Thank you for putting this together. I’m not exaggerating with my guess of 5%, accounting for how often I get to see the environment my rugs end up in; let alone the mock-ups. The library, in particular, is a room that I could spend some serious time in! The dining room table is a stunner, as well. It was interesting to see the living room rug in place, even though I have evidence of it still on loom. Ha! Did Daniela show you the loom photo? I’ve attached it for you—it’s going to be a great piece. Wow- That is really beautiful !!! Such wonderful renderings! Magnificent concepts! The Magritte homage is particularly inspired and forward thinking. Nice work John! I am still waiting for my Trump client to decide and I will let you know when he does.